You know you need to implement a loyalty program in your restaurant - but never got around to it for many reasons - not enough time, where do I begin, how do I market it, etc. 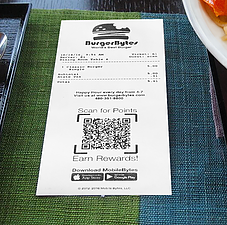 Research shows that consumers want and will use loyalty programs - and if done right, a loyalty program will bring your customer back to your restaurant. Programs needs to be easy to use and engage your customer. No one wants to carry around a plastic card anymore. And to be honest, no one really wants to spend the time to give their server or cashier their information to enter their loyalty points. So this is why I think the MobileBytes Loyalty Program is genius - it's called Scan for Points - customers simply scan the receipt with their phones. Boom! Points collected. And the program is free - yes, free - included with your MobileBytes system.